In January or 2011 I gave my sister's friend light-brown high lights. This was my first time ever doing color of any kind and I was nervous but excited to try something new. It took about 2 hours to do and the outcome was very nice. 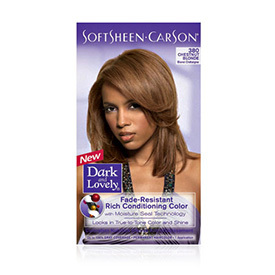 The color I used was Chestnut blonde from Dark & Lovely. She was happy with her hair and so was I. I was very proud of myself. All done. Letting the color sit. My name is Dominique but I go by Domo. I am a sophmore in high school and I LOVE to do hair. I do hair as much as I can in any spare time I have. I love being in the school band and I enjoy playing my many instruments.